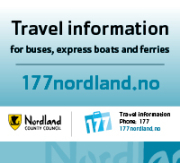 The map below shows an overview of Ferries/express boats along the Coastal Route – i.e., for the areas of Trøndelag, Helgeland, and Salten as well as Lofoten. Not all routes are included, but most are. The route numbers in the map are listed in the left margin above clickable links for each route.